The Winking Skeever is an inn and bar found in Solitude. It is the first building on the left-hand side when entering Solitude from the southwest. The name of the inn is proudly displayed on a sign adorning its front door. When asked about it, the owner, Corpulus Vinius, says that it was named for a childhood pet skeever that was said to be able to wink. If Corpulus dies, his son, Sorex Vinius, will take over renting out the inn's rooms, but Sorex will not buy or sell food. Gulum-Ei fences goods from his regular table if you have progressed far enough in the Thieves Guild quest line. * This person becomes a fence after completing Scoundrel's Folly. † This person becomes innkeeper if Corpulus is dead. ‡ Will be exiled here if The Pale is given to the Empire in Season Unending and subsequently retaken by the Stormcloaks. The entrance leads directly into a large common room where part of it has a vaulted ceiling while the center is double height with a wooden balcony above. There are wooden benches, flower pots containing deathbell flowers and pillars supporting the vaulted ceiling around the edge of the center of the room. Directly in front of you is the counter in front of the northwest wall. There is an alcove in the southwest wall, where Gulum-Ei sits. The innkeeper, Corpulus Vinius stands behind the counter and greets customers. On the counter is a bottle of wine and of spiced wine, a loaf of bread and several pieces of cheese. To the right of the counter is a woodcutter's axe driven into a block of wood. Minette Vinius will often be seen helping out, sweeping up, etc. Behind the counter are two stacked open crates each containing five bottles of spiced wine, with a small set of shelves on either side holding several empty bottles, a few sacks of foodstuffs and three more bottles of spiced wine. Hanging from racks above these are five rabbits, a pheasant, two garlic braids, two bunches of dried elves ear and a bunch of dried frost mirriam. In the western corner is another alcove storing a couple of food barrels, a few more food sacks and two sets of shelves hold a couple of cabbages, a bowl containing potatoes, a haunch of raw venison, three bottles of alto wine, three bottles of wine, five bottles of Nord mead and several more empty bottles. To the right of the counter are three tables, one of which has a couple of loose septims on it, around a cooking fire with a stone chimney with two openings at eye level, on the near side is a piece of cooked beef and a cast iron pot containing a cabbage and a potato, while around on the other side is an empty metal pot. In the alcove where Gulum-Ei sits is a small table and chair, with a baked potato, two salmon steaks and a couple of loaves of bread on the table. There is a narrow table against the rear wall with a potion of minor healing in a soul gem holder on top, while against the northwest wall of the alcove is a small cupboard with shelves above holding a potion of healing. 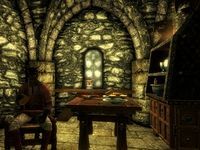 In the center of the room are four more small tables, two of which are laid with two plates holding salmon steaks, one is laid a sweet roll and a honey nut treat and the final table is where Belrand normally sits available for hire as a follower for 500 septims. His table has a bottle of wine and a plate of bread and cheese on it. There is also a long wooden table in the eastern corner of the room with another sweet roll and two more honey nut treats. There are two wall shelves along the northeast wall, one holds a couple of empty wine bottles while the other has a giant's club, that can't be taken. Nearly opposite this is a small cupboard with a platter holding two baked potatoes, a sweet roll and a couple of pieces of cheese. There is a wide corridor to the northeast with a narrow table along the northwest wall, with another salmon steak on top and an unlocked chest beside it. Opposite this on the southeast wall is a door into a bedroom used by Sorex Vinius, it contains a single bed in the eastern corner with a side table at the foot of it holding a bottle of alto wine. Next to this along the northeast wall is a narrow wooden table holding a bowl containing a rock warbler egg and a bulb of garlic. To the left as you enter, against the northwest wall is a small wardrobe with shelves above it holding a knapsack, a large coin purse, a bunch of jazbay grapes, a potion of healing and a flute. Beside this is a basket containing a bunch of lavender and a few sacks of food. Against the southeast wall is an end table with a copy of Shezarr and the Divines, while against the southwest wall is a tall wardrobe containing fine clothes and a wall shelf holding a potion of health, a potion of regeneration, a loaf of bread and some cheese. Under this is a long table and chair. On this table are a couple of bottles of wine, a goblet, bunch of lavender and a platter holding two baked potatoes, a raw rabbit leg, a pheasant breast, a sweet roll and a couple of pieces of cheese. At the end of the corridor, where it turns to the northwest is a set of shelves in the eastern corner holding a potion of minor healing and two potions of healing. The corridor leads to a stairwell with stairs up to the top floor and down to the cellar. At the top of the stairs in a large landing with a balcony looking down into the center of the room below. On the left at the top of the stairs is another set of shelves holding a potion of minor healing and two potions of healing. At the other end of the northeast wall is a narrow table with a chaurus egg, a hagraven claw and a stone bowl containing a bunch of lavender, a bulb of garlic, a sprig of snowberries, a blue and a purple mountain flower. Along the southeast wall are two doors leading to bedrooms with a low table between them. To the southwest is the balcony with two tables and chairs, the first table is set with a bottle of wine, a seared slaughterfish and a plate of bread. The second is holding a plate of bread and cheese with a bottle of wine, a goblet and a copy of The Cake and The Diamond. There are also two bookcases next to this against the northwest wall holding seven more common books, a master locked strongbox, a solution of strength and a potion of extreme stamina. To the right of these is a small wardrobe with the business ledger on top. 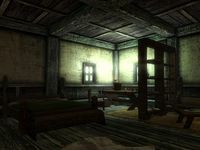 The bedroom to the left is L-shaped and contains a single bed at the southeastern end of the room with a low table and chair beside it, there's a copy of The Real Barenziah, v3 on the table and above the table, on the southwest wall are two wall shelves holding a bunch of lavender and a potion of plentiful healing. To the right, along the same wall is a tall wardrobe. At the northeastern end of the room is another tall wardrobe, a narrow table against the southeast wall with a bottle of wine and two honey nut treats on it and opposite are two bookcases holding eleven common books, a drum, a solution of strength and a potion of extreme stamina. The bedroom on the right is the room you get shown to if you rent a room, which contains a large double bed coming out from the southeast wall with an end table to the left holding a bottle of wine and a common book. There is a long unlocked chest at the foot of the bed. Against the northeast wall are two small wardrobes with a washbasin on a stand between them. On them are a jug, a goblet, and a platter holding a boiled creme treat, a carrot, a couple of loaves of bread and a sliced eidar cheese. To the right of the bed, against the southwest wall is a long wooden table with a bunch of tundra cotton, a potion of health, a potion of regeneration, a draught of strength and a drum. 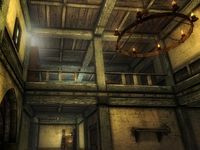 To the right of this, coming out from the same wall are two bookcases holding a potion of extreme magicka, nine common books and copies of two less common books; Charwich-Koniinge Letters, v1 and Amongst the Draugr. On the other side of the bookcases is a wooden bench and a low table holding a platter with a bunch of lavender on it and a common book. In the western corner is a tall wardrobe with a narrow wooden table to the right with another common book and a bowl of red and green apples on it. Descending the stairs to the cellar, at the bottom of the stairs is a dresser against the southwest wall with an iron dagger on top. The rest of the cellar is heavily vaulted with an alcove just after the dresser on the same wall containing two sets of shelves holding twenty-eight more empty wine bottles--(see notes). Straight ahead in the cellar is a large vat with two more alcoves, one to the to the northeast and the other to the southwest. The first of these has a couple of large vats at either end with some food barrels behind the one to the left. In front is a wooden table and a couple of chairs. The other alcove, to the southwest has a cupboard holding a bottle of each alto wine and wine, while the alcove continues to the left. At the southeast end is a cupboard holding clutter and two sets of shelves, one holding an iron dagger and a couple of pieces of cheese and the other holding a bottle of wine and two bottles of Nord mead, it also has an unlocked chest on top. Outside, along the northeast wall is a wood chopping block and at the back along the same wall is one of three thieves caches found in each major city once you have completed the relevant reputation quests. It is a barrel marked with Cache Shadowmark. This is the merchandise found in the Winking Skeever's merchant chest. These items are only available if purchased from the merchant; they cannot be pickpocketed or stolen. They are restocked every two days. A Fence shadowmark is next to Gulum-Ei as he is a Fence. A Loot shadowmark is to the bottom left of the entrance door. A Cache shadowmark is on a barrel on the northeast wall of the building after completing the relevant quest. Completing the Delivery quest for Sorex Vinius makes low value items freely available, including two beds that will grant the Well Rested bonus, (but not the rentable bed). There are a total of at least 56 empty wine bottles available for free as long as you have completed the above quest. These can be used at the Atronach Forge to make Conjurer's Elixir. This page was last modified on 19 November 2018, at 04:23.